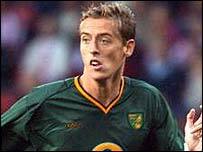 Norwich City's on-loan striker Peter Crouch has revealed he would like to stay with the club on a permanent basis. The giant hitman has enjoyed a successful spell at Carrow Road since joining from Aston Villa in September, and he wants to continue the Canaries' push towards the Premiership. "I think the manager (Nigel Worthington) here is working hard to try and keep me, which is nice," said Crouch. "He obviously has to speak to the manager at Villa (David O'Leary) so it is out of my hands really. I'll let them get on with it and just play my football. "If Villa do want money that is above my head, I just have to concentrate on the football. "If I go back to Villa it's not the end of the world, I can try and work to get back in the team there. "If not, I've enjoyed my time here because it's been good so far and I'd like it to continue," he told the Eastern Daily Press.